Lev's Paint & Body Shop is dedicated to giving our Richmond, Texas area customers quality collision repair at a competitive price. 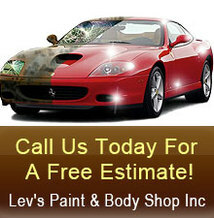 Lev's Paint & Body Shop is committed to providing only safe, reliable, and quality auto glass replacement and repairs. We use only quality OEM adhesives to install your automotive glass. Only the best methods and adhesives are used to ensure your safety. Windshield replacement is not a product, it is a service—a safety service. It requires the best materials that technology can provide, and it requires highly trained, skilled, and detail-oriented technicians to install the windshield properly. Windshields rank as the third most important part of a vehicle's SRS (Self Restraint System) system. Along with the airbag and seatbelt, the windshield is an integral part of the vehicle's safety system that is intended to keep its occupant safely inside the passenger compartment during an accident or a roll over. If the windshield was improperly installed, it could pop out during an accident, therefore causing the airbag to be useless. The windshield also accounts for 60% of the vehicles's crush resistance, so it is absolutely vital that the windshield does its job during a roll over. To have your windshield replaced properly, call Lev's Paint & Body Shop today to request a free estimate. Lev's Paint & Body Shop Inc.